As you know, I designed both the 3 muffle and the 8 muffle cremation furnaces, and this using mainly my free time at home. These furnace constructions pioneer the way for the future and I venture to hope that you will grant me a bonus for the work involved. 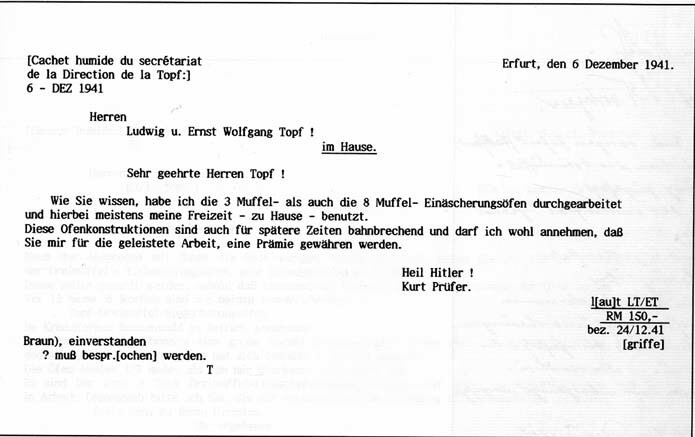 This hand-written letter from Prüfer, on its own, directly proves that he was the designer of the 3 and 8-muffle furnaces and is indirect evidence that he participated in the extermination of the Jews at Birkenau. The author has made a point of materializing Prüfer's bonus in actual notes below the letter so that the reader can assess the extraordinary deviations and no less extraordinary potentialities of the present era. For there is reason to worry about the demential causality involved in rewarding the cerebral effort that made it possible to reduce about 900,000 living people to ashes with two miserable pieces of paper bearing the portraits of two models of German success: on the 100 RM note, Justus Liebig, a remarkable chemist, discoverer of a method of measuring carbon and hydrogen inorganic bodies, whose work was behind the development of German chemistry; on the 50 RM note, David Hansemann, Prussian politician and economist, who developed the railways, improved the lot of manual workers and concerned himself with capital management, having been Minister of Finance and Director of the Bank of Prussia.